On New Years Eve, 2005 I heard that my old friend Tim Cole had started writing songs and was performing them at medieval events I arranged to get together with him to start recording some of his stuff. 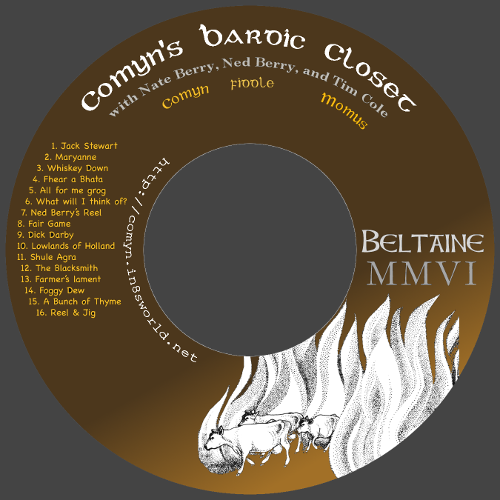 We started jamming sometime after Imbolc (February) of that year and worked a few things up to perform at the Beltaine feis which is early in May so the tunes were all either medieval or Irish-inspired folk. I was lucky enough to get my brother Ned (of Trespassengers fame) to play fiddle on some of the tunes. Since we were mostly playing at my house I recorded a lot of the stuff we did so I could give Tim a copy to practice at home or just to review with a critical ear. I soon got the idea to make a CD from the recordings which I would pass out for free at the event. I looked at all the possible CD burning solutions and decided on using a lightscribe drive - the discs just looked so cool with a greyscale image burned into them, and I wouldn't have to do any other artwork - I could just stick them into a clear case. The artwork (not mine) depicts cattle being driven through the twin fires of Beltaine, an ancient Celtic tradition for the purification of the herd. We didn't really have a name for the band, so I just came up with something off the cuff which nobody else really liked either. I passed out a bunch of copies of the CDs and they were really well received and I've gotten a lot of "word-fame" in medieval circles from it. Most of the recordings were second or third takes made with a partially working Fostex four track tape machine, in short they sucked - but I'm glad I have these copies of Tim doing his originals just the same.